Paid a visit to Ashton-Upon-Mersey Church this morning photos to follow. I will probably post some here a little later as well. Thank you, Gardener Bill. I will look at the photos in due course. The website article I had already found. I had all of the information save for the bit about showing bulldogs. Her mother seems to have retired down here near me in South Devon as she was living in Torquay when she died aged 74.
and since being back, and I have to be quite honest, forgotten my commitment. 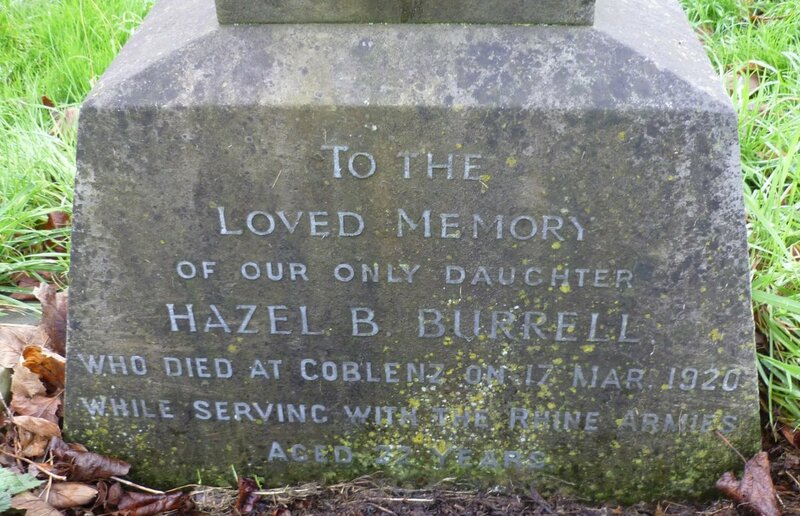 I came across this memorial to Hazel Bessie Burrell yesterday. Other than the obvious census info etc, I couldn't find anything out about her. 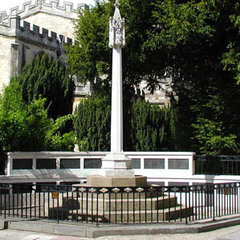 The family were in Thornton Heath in 1911 and the memorial, which I assume stands on the family grave, is in Croydon (Mitcham Road) Cemetery. MANGOTSFIELD, DOWNEND - photograph of the grave of Alice Maud DANN, VAD, died 27th July 1916, aged 44. I have a photograph lifted off Find A Grave but without copyright it is of no use to me. So another one required. Christ churchyard. BADGEWORTH - Mabel Whitmore Henrietta FISHER, died 22nd May 1916, aged 50. Photograph of grave required. Holy Trinity churchyard. CHELTENHAM - Gladys Mary GILLER, VAD, died 10th July 1917, aged 24. Photograph of grave required. Cheltenham Burial Ground, section Q, plot 10330. BRISTOL - Kathleen M. INGLIS, QMAAC, died 30th November 1918, aged 26. Her grave in Arnos Vale Roman Catholic Cemetery (Holy Souls) is recorded as L.G.3.1. This is believed to be unmarked and I would welcome a photograph of the plot so that others who would like to pay their respects can find it. I already have a photograph of her name on the memorial wall. OLDBURY ON SEVERN - Phoebe Elizabeth MEADOWS, VAD, died 20th May 1918, aged 28. She is buried in St. Ardila churchyard, grave B14. A photograph of her grave required. No problem Jim leave it with me. Totally new to me. Thank you. Phyllis Maltby, Nurse, 38/Devon VAD? I photographed their names on the memorial inside Budleigh Salterton Church this morning and can send if you wish. Photos sent, one of each panel and one of the memorial as a whole. Just an update on my quests. until Jul 18. I have been in contact with the local diocese who is looking at letting me in at a prearranged time to get my photos. Mabel Whitmore Henrietta Fisher - Holy Trinity.. photos complete and will send tomorrow evening. Gladys Mary Giller - Cheltenham Cemetery.. getting photos this week. burial map exists. A lady at the local diocese is helping to locate the grave and if she does I will pop over and take the photos. Phoebe Elizabeth Meadows - St Ardila.. photos complete and will send tomorrow evening. Simon, Well done with progressing these. I don't think that you can blame yourself for not checking the availability of Christ Church. Like "no-one expects the Spanish Inquisition" (Monty Python quip) so no one could have thought that the church would be closed. In the scheme of things Kathleen Inglis is unfortunate. I have looked at the CWGC Graves Registration Report Form. Katherine Inglis is laid next to Private W.P. Fitzgerald (Royal Defence Corps) who is in grave LG 3.2. I have been trying to work out the CWGC abbreviations (anyone have a list ? - cannot see in Williamson, only part covered on the CWGC website). If Kathleen 's M.W. means Memorial Wooden (temporary wooden cross) then that would explain why there is no grave marker now. But I have no idea what CHS re Fitzgerald means but if it is a permanent grave marker then Kathleen's grave should be findable as next to his. We do know that she is in what was known as "the War plot" in the cemetery. According to CWGC, MW is "Military Memorial Wooden" and would, as you say, point to the original temporary grave marker. CHS is not in their online glossary, but I have taken it to be "Commonwealth Head Stone", or similar and referring to a CWGC headstone. Looking at the CWGC documentation for both Fitzgerald and Inglis, Kathleen would appear to have originally been on the list for a CWGC headstone, but it didn't happen and she is commemorated on the Screen Wall. Thank you, Phil. I knew that her name was on the Screen Wall. I know the reasons for it but it seems such a shame that Screen Walls should be used at all if the whereabouts of the graves are actually known. If I were family and wishing to visit the grave I would hate to be in a cemetery where one knows she is buried but can only genuflect to a stone slab. Alice Maud Dann - Downend / Christ Church.- Pending will be done in the next 2 weeks. the branches next to the cross. It will be cleared shortly and then I will have access. Ouch. What a shambles. At least you know exactly where she is for a revisit. registers are under lock and key, but there is a section for WW1 and wW2 on the news part of the web site. under projects they are going to do some work on interesting groups. so may be worth dropping them a line to see if they want to do a section on the VAD's. you could contact the admin, on the contact page and see if he can photo for you. failing that, we are back down in March and as its reasonably easy to find, if they can get their layout, under the resources tab sorted then can call in again. I would expect there to be headstones for such luminaries, hopefully still legible. I shall investigate! I occasionally visit a well known farm shop (Uncle Henry's) which is in Kirton in Lindsey, if you can let me know the details for there and for Blyton (which is not too far from there) I shall see what I can do for you.